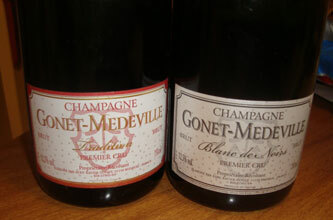 Gonet-Medeville is a Grower-Producer run by husband and wife team of oenologist Xavier Gonet and Julie Medeville. Xavier comes from an old Champagne family from Mesnil sur Oger, and in 2000 the young couple started producing wines under their own label. From Julie's side of the family, they also took over in 2004, Gilette and Les Justices (two Sauternes), and Respide-Médeville (red and white Graves). Of these I've only had Gilette, a couple of old vintages, and they are impressive! 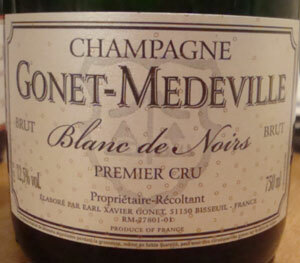 Gonet-Medeville is located in Bisseuil in the Marne Valley, slightly East of Epernay. They have 12 hectares of vines including both Grand Cru (Mesnil, Oger and Ambonnay) and Premier Cru (Bisseuil, Mareuil sur Ay, Trepail, Vaudemange, and Billy Le Grand) holdings. The vines are sustainably farmed, have low yields, are harvested by hand, dosage is low, and malolactic fermentation is blocked. The Grand Crus are vinified in wood as are aboout 30% of their Premier Crus. Wines are as follows, although details on their Web site sometimes vary from the French to the English version. We tend to trust the French version somewhat more for obvious reasons! Tradition Brut Premier Cru - 70% Chardonnay, 25% Pinot Noir, and 5% Pinot Meunier. Vinified 30% in old casks and the rest in temperature controlled steel vats with 7 grams/litre of dosage. See the tasting note below. Blanc de Noirs Premier Cru - 100% Pinot Noir from Bissueil. Vinified 30% in old casks and the rest in temperature controlled steel vats with 6grams/litre of dosage. Tasting note below. Premier Cru Extra Brut Rose - 70% Chardonnay, 27% Pinot Noir, and 3% still red wine from Ambonnay. Vinified 100% in old casks with 3 grams/litre of dosage. La Grand Ruelle Grand Cru - 100% Pinot Noir from Ambonnay, entirely vinified in old oak casks, with 3 grams/litre of dosage. Only 1000 bottles made per year. Cuvee Theophile Grand Cru - 60% Chardonnay and 40% Pinot Noir, from Ambonnay and Le Mesnil, entirely vinified in old oak casks, with 2 grams/litre of dosage. 3000 bottles produced per year. The cork came out with such a force that it almost dented the ceiling! Straw yellow with vigerous bubbles. The nose initially has yeast and fresh baked bread, follow by white fruit, chalk, and other minerals. A touch of strawberry as it warms. Pears, starfruit, and orange. As soon as it's tasted there are bright sweet fruits, definite strawberry. Delicious! It could almost be a rose (and the bottle makes it look like a rose too!). This is an open and giving wine. On the sweet side. A fun wine indeed. Raspberries immediately on the nose, along with minerals, chalk, and golden apple. On the palate, sweet red berries and strawberries with a great balancing dose of minerals. Hyper fresh raspberries. Almost mouth puckering. No, slightly mouth puckering. Some pomegranate and dark cherries. 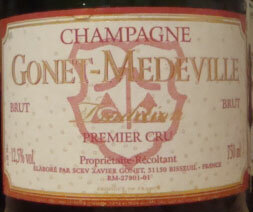 Like the Tradition Brut above, an open and giving wine and lots of fun!